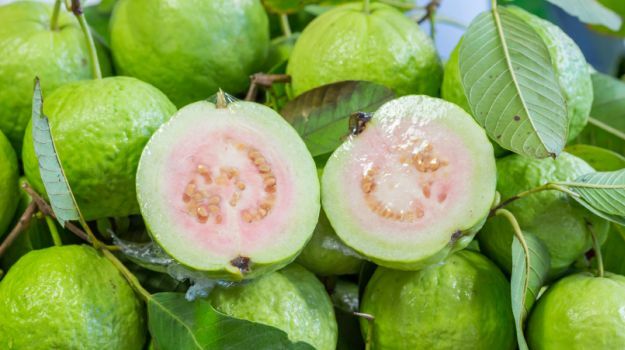 Guava is known as amrutphal. A person becomes healthy from body and mind. Guava is considered as Amrit. Guava is used in many medicines. Guava not only gives benefit but also creates problems. The guava tree in lord Rama temple is very beneficial. Guava cures mental problems and mental diseases. Guava removes sorrow from our body. Guava increases concentration. Do not break any tree’s twig. One should use twig, which is fallen on the land. Use broken twig, it has peel, which is very important. Keep this twig in front of Hanuman. Chant “Om Hum Hanumantaye” for 11 garlands. Then wear it in throat. It is beneficial for those who get fear, weak concentration and face litigation. The leaves, which can be found in ancient temple of Shri Ram, are also beneficial. Take turmeric and write pang lang dang or Ram Ram Ram and flow it in clean water. One can flow it daily or Tuesday or Saturday. The guava leaves is beneficial for men and women in many diseases. Drink guava leaves juice after sunset and drink fresh water after 1 minute. This avoids many diseases and one gets power in the body. People suffering with sugar can chew 5 guava leaves in the morning. This controls sugar of the body. Take 3-4 teaspoon guava juice before 10 minutes of your breakfast. This reduces irritation of liver. Do not eat more than 2-3 guavas in a day. The consumption of guava after sunset may prove harmful. Having guava as medicine gives more benefit. Guava is extremely beneficial to avoid infection. Drink 4-5 guava leaves juice before going outside. This also increases platelets, people who suffer with dengue. Take guava leaves along with guava in the home. Guava juice is extremely beneficial for everyone. This avoids any types of infection. Cut the guava from the middle. Do not eat guava without cutting it in monsoon. Heat it on gas and remove the black spot from the guava. Children can eat it before dinner. This balances the hunger of children. This strengthens the lungs. Children get stomach problems if their parents has problem. In this case, they should eat 100 gm guava after wake up in morning. One can mix tomato and black salt in guava. The banana and guava leaves reduce inflammation of the injury. Children should drink guava juice. This avoids dengue, infection and water born diseases.